At the popular cooking website Allrecipes.com, visitors want to know one thing: How can they cook for less? Plan ahead. Shopping with specific meals in mind for the week ahead makes it easier to buy in bulk and repurpose ingredients, turning Sunday night's roast chicken into Monday night's enchiladas. A lot of folks get in trouble when they don't plan ahead. The day takes longer than expected, and they're ordering out or reaching for ready-made meals, and those are very expensive. The more you can cook from scratch, the further your dollar can stretch. Do it yourself. Instead of buying a package of grated cheese, buy a chunk and grate it yourself. We pay for the convenience of all these things. Also, try making homemade hummus, which takes about seven minutes with a food processor, as well as homemade pizza dough, which doubles as a fun activity for kids. Rediscover eggs and beans. Even though the price of eggs has gone up, they're still cheap compared with meat, and they are incredibly versatile. Around $3 (at about 25 cents an egg) can generate a dinner frittata, brunch strata, or quiche, she says. On the same note, a simple dinner of black beans and rice—plus chopped onion, olive oil, seasonings, and shredded cheese—can make dinner for two for under $5. Go meatless. Cooking vegetarian meals often is a good way to save money. Meat starts at $2/lb in most areas but there are many other sources of protein like nuts, eggs, and beans that are much less expensive. Reinvent leftovers. Extra rice can go into a fried rice dish the following night. Certain dishes, such as lasagna, chili, and soups, also are easily made in large quantities that can be frozen or eaten throughout the week. Use what's in the fridge. Home cooks stuck with extra eggplant or flounder can avoid wasting food by using websites such as Allrecipes.com and the FoodNetwork.com to search for dishes based on the ingredients they have at home. Keep track of what your family spent on food each month, & you might be shocked on how much you actually spend per month. Then follow these methods to save more $$$: 1. Be REALLY careful to use up leftovers & never waste food. It is shocking to realize how much the average family throws out. 2. Coupons & freebies, although these just save a few extra bucks, the more you look for good deals, the more you will save. 3. Cut down on specialty ingredients when cooking. This may not affect everyone, but if you buy a few gourmet items it really ratches up your bill at the checkout counter. 4. Fewer takeout & restaurant meals, which is a no brainer....if you get rewards points from your credit card they sometimes have gift cards from restaurants. Amex has PF Chang's, Cheesecake Factory, & other good ones. 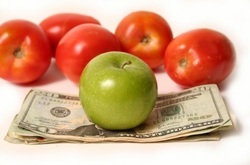 With these tips, not only will you save money, but your waistline as well!